This picture was taken yesterday, a full two days before we leave for our weekend in Lake Tahoe. Her excitement is truly infectious. I can’t wait to see her face when she realizes just how cold the snow really is. Aww that is adorable! We haven't managed to make it up to Tahoe yet but I'd love to take our boys next year. I love how much the truly LOVE and get excited by everything! I love the Hello Kitty boots. Tahoe is cold but it is so much fun. Enjoy your trip. 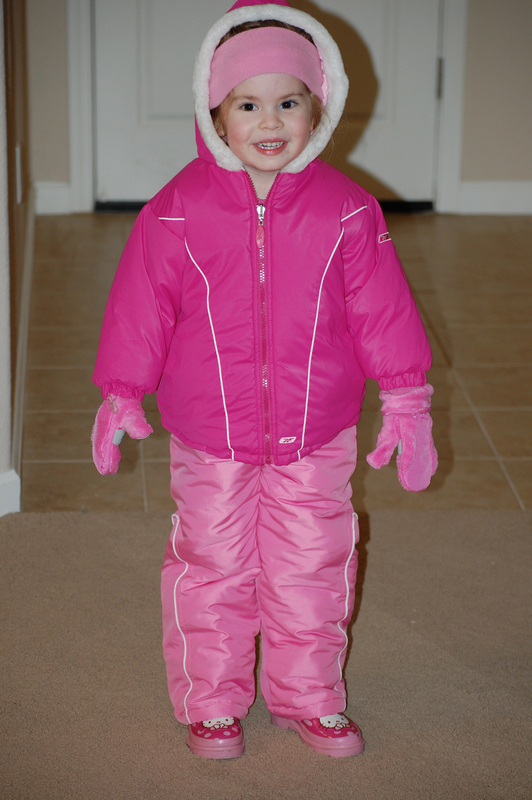 Dressed in head-to-toe pink you definitely won't lose her in the snow!! That's a good thing. She'll like it right away..but will be cold after about….3 minutes!!! Have a great time!! Oh my! She'll have so much fun. Kids don't care how cold it is. Mine stay out in the snow for two- one hour sessions each day at daycare! She's such a cutie, and getting so big. Have a great time at Lake Tahoe! She is SO cute all cuddled up in her snow gear! oh she's so adorable in her link snowsuit with her matching pink cheeks! your snow photos are going to be priceless. I can't even imagine how cute she'll be! also: thanks so much for your incredibly sweet comment yesterday. it truly made my day! So very cute!! Take tons of pictures, I know you will…..and enjoy your little family. So very cute!! You better take lots and lots of pictures!!! Sadie has the same boots! By the way…Sadie and Katie would a freakin' blast together!!! TOO CUTE! I took my then almost-3-year old to Tahoe last year and he loved it. He turned four this weekend. Two days later, he asks "Mom, is it two more days until I turn 5 years old?" Talk about anticipation! It broke my heart a little to say "No, it's 363 more days, Booty…363." Oh, I can't wait until she sees it! How exciting. Great pic. Sometimes I have to avoid telling Ainsley anything that's going to happen because she doesn't quite grasp the idea of anything but RIGHT NOW!! Isn't it amazing how we can totally lose that sense of anticipation as adults and the minute we have little ones it all comes back? Love it! She looks SO excited – and she makes me SO envious of you guys and your warmth! SO cute, especially because right now, Felix is super excited by his spring outerwear, because the grass is peeking out from under the snow cover and it's above freezing–he can wear a down vest, and shoes instead of boots! So cute! What a fun weekend lies ahead. Have a great trip! SO cute – the anticipation on her face is palpable! So cute! Kenzie has the same boots! Have fun on your much anticipated vacay! Pink perfection, right down to those hello kitty boots! She looks ready to take on the snow!